Brush Manicure Mirrors Personalized in Bulk or Blank. Promotional, Inexpensive. 3 in 1 Kit at an amazingly low price. 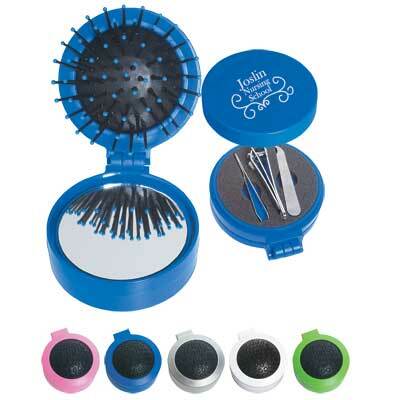 Handy personalized bulk mirrors with hair brushes and manicure sets. We also supply wholesale blank (not custom imprinted) Brush Manicure Mirrors: see the Price List below. Budget Prices in USA and Canada for wholesale promotional Brush Manicure Mirrors. American clients pay no taxes. The unit prices below include your 1-color custom imprint on one side, or they are for blank (not custom imprinted) Brush Manicure Mirrors. Setup Charge: $40.00 per color; $25.00 on re-orders. Extra imprint color: add $0.25 per color, per brush manicure mirror. Colors: Silver, White, Royal Blue, Pink or Lime Green. Packaging: Cello Bag, 250 per carton @ 35 lbs.